The orbits of the planets are coplanar. We send probes out along this plane to explore planets. Why can't we send a probe perpendicular to this plane (say due north from the earths perspective) and get images of the Milky Way? Or some portion of it? Or a top down view of our solar system? Voyager 1 is now 141.56019675 AU away. Would a similar probe that far away not be able to send back wide angle images from a different perspective? Or has this been attempted already? To get a picture of the Milky Way from a different perspective, one would have to travel a very long ways. Very few stars would appear much different from Alpha Centauri, which is light years away, and far beyond anything we can do. 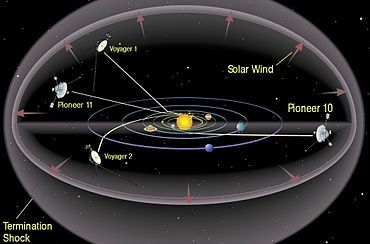 Voyager 1 will take a very long time to reach that far, its speed is only about 1 light year every 20,000 years! And it will be dead long before that. Thus, there simply isn't much reason to do this, although when we have the ability to send interstellar probes, it would become more interesting. Furthermore, we actually have sent interstellar probes outside of the Solar plane. Note that Voyager 1 is about 45 degrees to the plane, and Voyager 2 is going below the plane. Essentially these probes passed close to a moon, and took a path that sent them in unusual directions, but achieved the best science. Not the answer you're looking for? Browse other questions tagged probe trajectory interstellar-travel deep-space photography or ask your own question. Once lightyears out of the solar system, could you expect to get feasible propulsion with a solar sail? What is the best approach vector for orbital capture by an outer solar system body? Can a single-apparition comet be used to propel a deep space probe outside of our solar system? Why are the Right Ascension of spacecraft leaving the Solar System so similar?